It is our pleasure presenting You the original Microbench, invented by Qioptiq! This compact 4-rod construction system is in serial production in Göttingen, Germany since 1963. 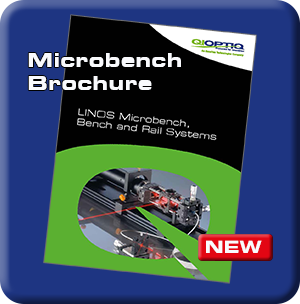 The LINOS Microbench was developed by Qioptiq predecessor Spindler & Hoyer as an innovative replacement of the triangular rail system. Small in its dimensions, precisely centered, simple to integrate, easy to expand, and very rugged: the LINOS Microbench is ideal for all spatial structures in any compact form. Thanks to the broad range of optical and mechanical components available, the LINOS Microbench is an integral part of many optomechanical instruments. Take advantage of more than 50 years of experience to ensure the highest precision and stability for your requirements. For a rapid setup of your optics, Qioptiq offers a large array of mounted optics developed specially for the Microbench; look for the m symbol in the catalog. Optics with Ø of 18 to 31.5 mm; illumination and imaging assemblies; optical inspection, measurement and testing equipment; interferometric applications, and more.